The bow is an integral part of playing on violins, as well as on violas and cellos, except when plucking and strumming the strings. 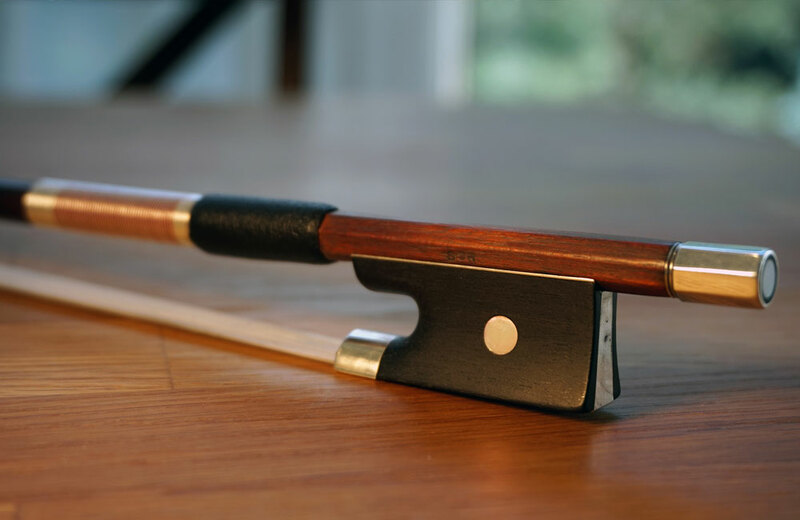 The bow, like the violin itself, is crafted and consists of many parts, each with its own set of functions and many of those parts requiring ongoing maintenance. The stick is the bow’s main wooden “body” and gives it its curved shape, curving inward towards the hair. Violin bows used to curve outward, which allowed for all strings to be played simultaneously. Though concave bows can handle fewer strings, they are more responsive and efficient. Bow sticks are made mainly of pernambuco, a hard, resilient wood that gives the bow a long life. The pad of the bow, also known as the grip, is located towards the bottom, just above where the hairs attach to the frog. Grips are made of thin leather. The player’s fingers are placed on the grip, and the bow is held there between the tips of the pointer finger and the thumb, which goes between the grip and the hair without touching the hair. The frog holds the hair of the bow at its lower end. The hair travels through the frog, which keeps the hairs flat and avoids entangling or bunching. The octagonal screw, or adjuster, is found at the bottom end of the bow. It tightens and loosens the tension of the bow hair by being twisted left and right. The hair of the bow is typically made of horsehair. It extends across most of the bow’s length, forming a ribbon that grabs and oscillates the strings when playing violins, as well as violas and cellos.